Oh what fun I am having! Did I mention how much I love the sun?! Well I do. We are spending our days (after work) at the park or beach and I'm loving it. I had fun with this one. I love Sweet Slumber Specialty DSP (btw, will be gone after this month so get it now or forever hold your peace!). I think the colors are good for a Father's Day card, but I kept this one blank and it can go for any occassion. My favorite part about this card is the little girl. I bought this stamp from Whipper Snapper Designs because her name is Sofia and my daughter's name is Sophie, I couldn't resist! She actually totes a wagon with a potted flower and kitty, but I went with out that and put flowers from SU! 's Loads of Love behind her, like she is going to suprise you. I think I might give this to my hubby for father's day, wouldn't it be great?! Anyway, I enjoyed this challenge and am loving those courdaroy brads! This next card is something I was commissioned to make for a co-worker to congratulate her on a promotion. The card is large (6X6) so plenty of signatures can fit on it. She likes gardening and green is her fave color- so that works. I used the Dreams du Joir set that quotes Woodrow Wilson, "We Grow Great by Dreams". 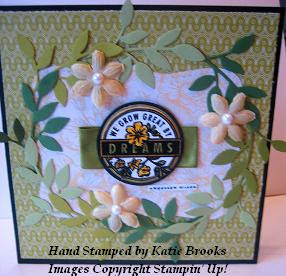 I had fun framing the image with folded ribbon behind, the top note die in the backdrop and the little leaves dies in mutiple colors coupled with flowers died So Saffron From the Pretties Kit and the added pearl centers. 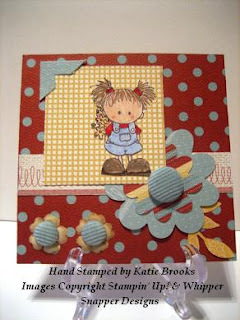 This is my card for this weeks Timeless Tuesday over at Flourishes- where the challenge is to use frames. Thanks for stopping by and hope you have enjoyed this post and the sunny weather! Super cute cards, Katie! Love them both! Enjoy the sun...are you using your sunscreen?? Sorry, but I work for a dermatologist, so I can't help it! And I've had 2 skin cancers already. WOW! Awesome cards...both of them! Love the vibrant colours on the first and the soft colours on your second. Wonderful all round! Great use of cord buttons! Fabulous job on the Mojo Monday sketch. These are fabulous cards Katie!! Katie your cards are wonderful!! !